Deadpool is now officially part of Disney. The Fox acquisition deal finally closed earlier this week and there are about to be some big changes in the coming months. 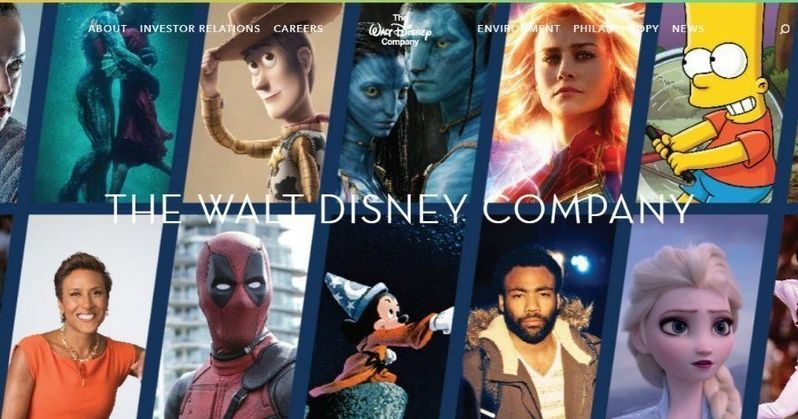 For starters, you can head over to the Walt Disney Company website and see their new banner, which integrates some of their new properties, including the Merc with a Mouth, who is pictured right next to the iconic Sorcerer Mickey from Fantasia. It's definitely a pretty weird image to see considering how different the two characters are and what they represent. The exciting promise of Deadpool 3 isn't the only new addition to the Disney banner. The Simpsons, specifically Bart, are also represented. Simpsons showrunner Al Jean celebrated the Disney and Fox deal by posting a picture of Homer strangling Mickey Mouse while Bart looks on, smiling and feeling grateful to not be the one at the end of Homer's hands. It's pretty crazy to think about just how much Disney just swooped up in the landmark $71.3 billion deal. The Avatar franchise, The Shape of Water, and Donald Glover's Atlanta were added to the Disney banner too. As for what Disney acquired in the deal, that includes, Twentieth Century Fox, Fox Searchlight Pictures, Fox 2000 Pictures, Fox Family and Fox Animation. Plus, Fox's TV units, Twentieth Century Fox Television, FX Productions and Fox21. The FX Networks, National Geographic Partners, Fox Networks Group International, Star India, and Fox's interests in Hulu. The deal was first talked about last year, but it took a while to get the wheels in motion after outside bidders tried to come in and take the deal from Disney. Deadpool and the X-Men franchise are some of the most-talked about acquisitions in the Disney and Fox deal. It is believed that the latter will be totally rebooted and placed into the Marvel Cinematic Universe under the supervision of Marvel Studios boss Kevin Feige. As for when this will actually happen, sources predict that it could occur as early as 2021, which is pretty fast. It's going to be very interesting to see where the MCU takes some of Fox's Marvel properties now that they have them back. Fans are hoping for a new take on The Fantastic Four in the not-so-distant future. While the X-Men franchise is expected to be rebooted, Deadpool will reportedly remain untouched as will The Simpsons (obviously). However, it is unclear how the Merc with a Mouth's movies will be released when that time comes. Disney CEO Bob Iger recently expressed an interest in keeping some projects under the Fox banner, which is now Disney, and that makes sense. Unfortunately, that more than likely means that we won't see Wade Wilson mingle with the Avengers or show up in a future Captain Marvel movie. With that being said, stranger things have happened. You can head over to The Walt Disney Company to check out the latest banner with all of the new additions.